“So I have to ask… where do you go to the bathroom?” This is first question asked by friends after we give them a tour of our camper van. It was also my biggest concern before moving in. Much to our surprise, I can happily say we’ve been on the road for over a year, and finding bathrooms has never been an issue. So where do we go to the bathroom? And why is this not a problem? For one, we consider ourselves adventure campers. We spend 95% of our time on BLM land, state parks or in campsites. Almost all of these places have either bathrooms or vault toilets. If we happen to stay on BLM land without anything nearby, we go with the old boy scout rule of ‘leave no trace.’ Basically, this means if you have to go number two: dig a hole 6-8 inches deep, do your business and cover it afterward. On average, we end up somewhere near an actual toilet at least once per day. Gas stations, grocery stores, fast food chains, parks and visitor centers are abundant with toilets. Guys, you have it easy on this one. The pee bottle (also known as a piss pot) is real and widely used. Just make sure you get one that seals shut and close it tight. I’ve read more than one horror story of someone knocking it over in the van! What about the girls? Similarly, a funnel can be used to guide your pee straight into a bottle. There are companies that make fancier versions like the SheWee or GoGirl. But realistically, any funnel should do. To clean a pee bottle, first rinse it with hot water and dish soap. It can then be sterilized with a mix of baking soda and vinegar. Bucket toilets operate exactly as they sound. Simply line the bucket with a plastic bag, do your business, then cover it with either saw dust, kitty litter, or peat moss to keep the smell down. The plastic bag can then be disposed of in a dumpster just like dog poop bags or diapers. 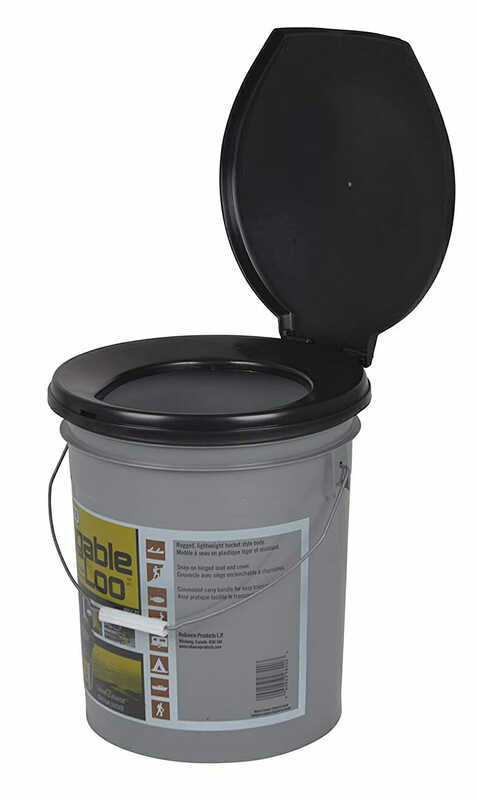 The Luggable Loo is perhaps the most popular portable camping toilet. It is essentially a 5-gallon bucket that comes with a toilet seat and lid. The snap on lid will allow you to keep everything closed up and even use it as a separate seat as needed. Slightly more expensive versions can be purchased that include rubber gaskets sealing the lid to reduce smell. Each of these will operate in the same way requiring separate toilet bags and a gel or saw dust covering to keep things fragrance-free. There are a few key components to making an experience with a DIY bucket toilet more pleasant. For maximum odor control: dump the bag between each session. Keep solid and liquid waste separated. This is essential to reducing unpleasant smells. If you don’t want to purchase a ready-made bucket toilet, it’s easy to build your own. A 2-5-gallon bucket can be purchased at any hardware store or Walmart. Chances are, you’re going to want to sit on something other than the sharp, thin lid at the top of a typical bucket. The cheapest route to go is purchasing an inexpensive pool noodle or ring of foam that can be sliced down the middle and placed over the rim of the bucket. This will serve as a stable toilet seat. The downside to a DIY bucket toilet is that it can’t be closed and needs to be emptied on a frequent basis. To combat this, there are a few inexpensive bucket toilet options that operate in much the same way but provide more comfort and a sealable lid. 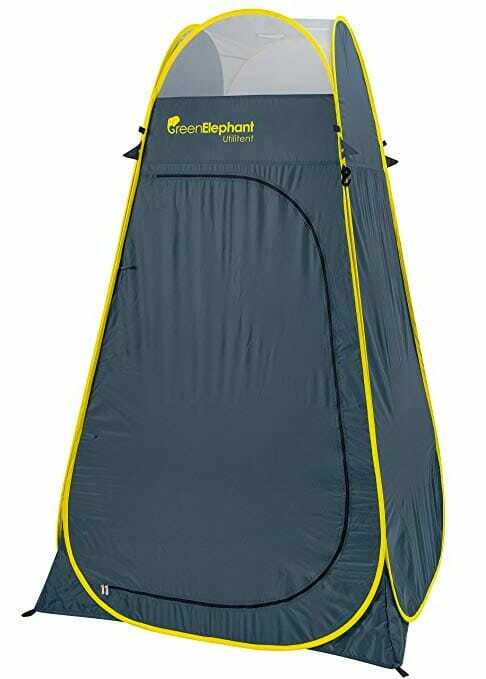 If you’re camping, or staying in one place for long periods of time consider purchasing a toilet tent. Toilet tents can be used outside the van or in a campsite to add a lot of privacy. They pack down small and are simple to set up. Cassette toilets (also known as chemical toilets), are common among the RV community. They are similar to the toilet you have at home and will flush your waste away into a black water tank below. These toilets do not use any electricity or batteries making them completely mobile and great to take camping. They are also lightweight and compact which allows them to fit inside of a small campervan. How Does A Camping Cassette Toilet Work? You fill the fresh water holding tank with water and the chemical reservoir with toilet disinfectant. To use the toilet: simply do your business, flush it with a hand pump, then empty the waste tank later. With a chemical toilet there is minimal smell, and the solid waste will get broken down into a liquid form making it simple to clean. The waste tank will have latches so it can be separated it from the toilet seat and lid. Most come with their own handle that makes carrying it to a RV dump station or marina easy. Pour the contents down the appropriate waste area. They can also be dumped in a residual toilet or porta potty. This is a clean solution and you won’t have to worry about touching anything. The waste receptacle can be washed out with water and ammonia to deodorize future smells. Portable cassette toilets are an ideal solution for camping and van life. They will be the most familiar to use and you do not have to separate solid from liquid waste. Most parts such as the pump or valves can be replaced if they get damaged so they are long lasting. Aside from not being purely environmentally friendly, a downside to the chemical toilet is that the liquid could freeze in winter and damage the toilet. To prevent this, purchase an environmentally safe anti-freeze from an RV dealer. For a quality portable flush toilet, you can expect to spend roughly $100. Because waste is hidden in a reservoir, you may not be able to tell when the toilet needs to be dumped. On some models, you may have to physically remove the waste compartment to check. In other models, an indicator will change colors when the toilet gets full. Composting toilets are often used as an alternative to RV toilets. People like them because they are environmentally friendly, do not use chemicals, and can last longer in-between emptying. While these are great toilets to install in a campervan or RV, they do require 12v electricity so they cannot be used as a stand-alone toilet at a campsite. A composting toilet requires an extensive amount of setup. They are also more expensive than a portable cassette toilet. How Does A Portable Composting Toilet Work? With a composting toilet, odor is kept to a minimum by separating liquid and solid waste. There is a liquid diverter door that can be operated using a lever that will divert liquid waste to a frontal bottle. The lever can be moved the opposite direction to allow solid waste to fall directly into the composting bin. It is not possible to use both at the same time. Composting toilets have a small ventilation fan that will pull clean air in, and vent exhaust through a pipe outside of the vehicle. This means when setting up a toilet, you will have to build in an external exhaust and hook up the toilet to electricity. The exhaust fan is very small and will draw as little as 0.1 Amps. Due to the exhaust system, there is no odor associated with composting toilets except when cleaning it out. During this process, it smells like soil. Liquid waste must be emptied on a frequent basis and sometimes it can be difficult to tell when it is getting full. Solid waste will fall into a mix of either coco coir or peat moss. After depositing solid waste into the composting mix, you will have to turn a crank to mix everything together. The solid waste in composting toilets can be dumped into a garbage bag and disposed of in a trash can. Because everything is separated, you should only have to dispose of solid waste every few weeks for two people. Composting peat moss or coco coir comes in bricks that can be broken down and mixed with distilled water when getting the toilet ready for the next round of use. 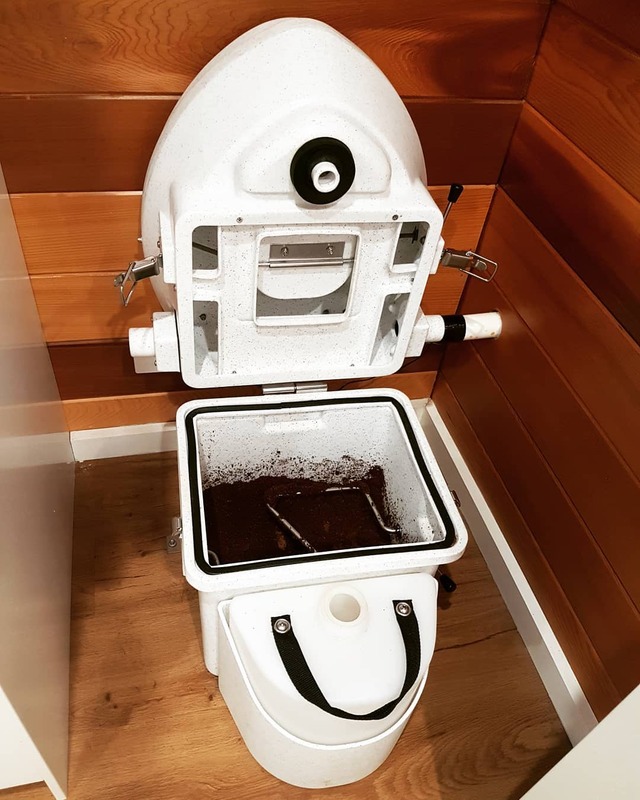 In our opinion, composting toilets make a great alternative for RVs or campervan conversions. They are not good for campsites because they are not portable and require electricity and ventilation. That said, composting toilets are environmentally friendly and easy to use once installed. What do you do with toilet paper? In a bucket toilet, it is safe to dispose of toilet paper along with your waste. In fact, you can even bury toilet paper if you’re going with the boy scout method as it is biodegradable and will break down rapidly (as long as the hole is 6-8” deep). For all other forms of toilets, it is generally best not to wash toilet paper down with your waste. This could clog the system of chemical toilets and quickly fill up your composting toilet. The best-case scenario is to have a separate bin where toilet paper can be stored until it is thrown away. If you really want to mix toilet paper in with your waste, there are special quick-dissolve toilet papers made specifically for this scenario. So What Is The Best Portable Toilet? 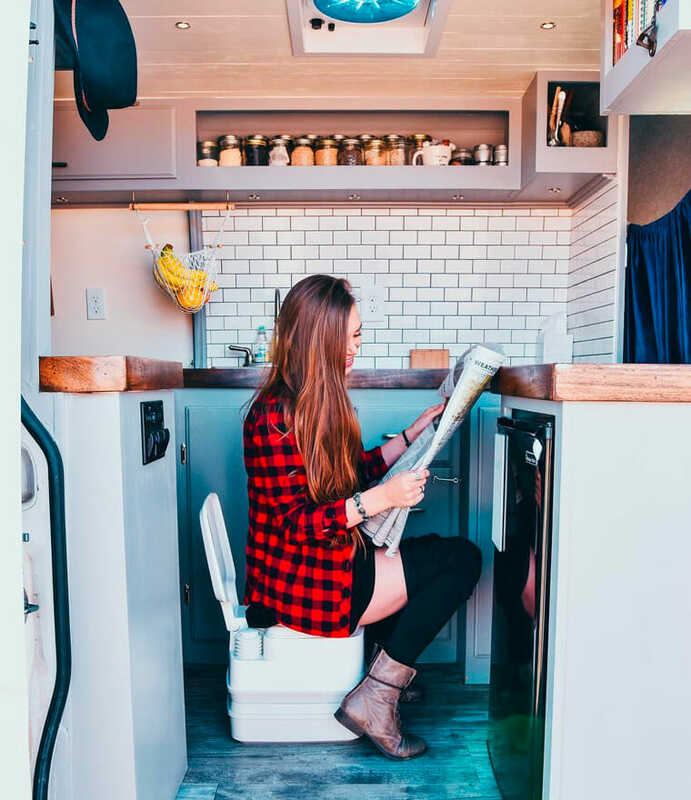 As with everything else in the van life, personal preference plays a huge role in what type of toilet you will want to use. We decided to not hassle with anything and use public facilities, but there are plenty of options available for people who want a more private and homey experience. Building a DIY campervan with electricity or traveling in an RV? Nature’s Head Composting Toilet is the longest lasting between waste stations. Great article, thank you. You might also consider including the Laveo Dryflush toilet which seems to be gaining in popularity. It uses a recharchable battery and really minimizes the ‘ick’ factor. Been camping most of my life. Using public facilities was easy when I was younger now in my 70s I need occasional indoor plumbing. My husband does not so explaining my needs he hears wants. Night time and early morning I want very close plumbing. Cheep is workable for me. I have a class b van w toilet and shower and I wouldn’t trade for a van without some kind of toilet. 1) convenience even while travelling , like say when you are downtown in a big city looking for parking, everyone but the driver has a toilet. The same is true while on rural interstate. 2) safety. You are much less likely to be mugged or attacked by an animal while inside your vehicle. This is ESPECIALLY important for women and children. 3) sanitary conditions can be controlled inside your vehicle, they cant be in rest areas etc. This is so hopeful! My wife Taylor and I are trying to get our hands on a 2019 Sprinter Van 4×4 since the 2016, 2017, and 2018 models aren’t available…anywhere. We’re hoping the 2019’s are put on the production line soon (fingers crossed). That being said I have been doing my research on our build and really thinking about leveraging the Nature’s Head but also considering the Airhead. Do you have any thoughts/opinions on Airhead?